Media personality Stephanie Coker has done a lot to safe her marriage which has suffered a lot of hurdles this year. 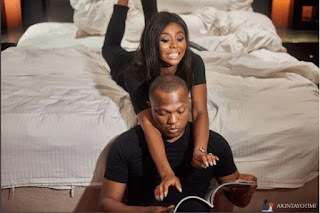 From her husband being allegedly involved in a fraud scandal to rumours of his infidelity, but nevertheless, Stephanie isn’t allowing the negative vibes to get to her or end her marriage and the couple who got married in a lavish wedding in Greece last year are seemingly still waxing strong. Amidst the controversies, Stephanie surprised her husband with a beautiful portrait for Valentine.